Good Afternoon everyone. Today we are going to discuss the potato. Calm down Ms. Tigerlily, I know that for extra credit you did an essay with diagrams, charts, and illustrations about the history of the potato. You will be getting credit for it. And Ms. Kristen, I'm well aware that you grow your own potatoes, so you are well versed in all things potato. Extra credit for that as well. Lisa, as we are now in college, going to the bathroom is done on your own time. No hall passes here. I am an esteemed member and one of the founders of this club and as a potato laureate, I do not want to talk about the history of the potato. What I'd like to do is wax poetic about french fries. Maybe wax isn't the appropriate word because waxy is not what you want in a french fry. Get it? I love a little potato humor. So how many of you have actually made french fries? A show of hands, please. Okay, so most of the class. Now let me ask how many of you made french fries in the past six months? Ah yes, that's what I thought. Except for Kristen most of you haven't made them lately. Too much work, not worth the payoff. Never as crispy as you'd like. All those are very good reasons but I can assure you after you are done with my class these things will be in the past. With a little effort, forethought, planning, and grease (another little witticism) your french fries will shine and not because of the oil. A little story first... when I was little, once and awhile my mom made french fries. I was like the Tasmanian devil for those fries. Running in and out of the kitchen, trying to steal whatever fry I could get my grubby little hands on. 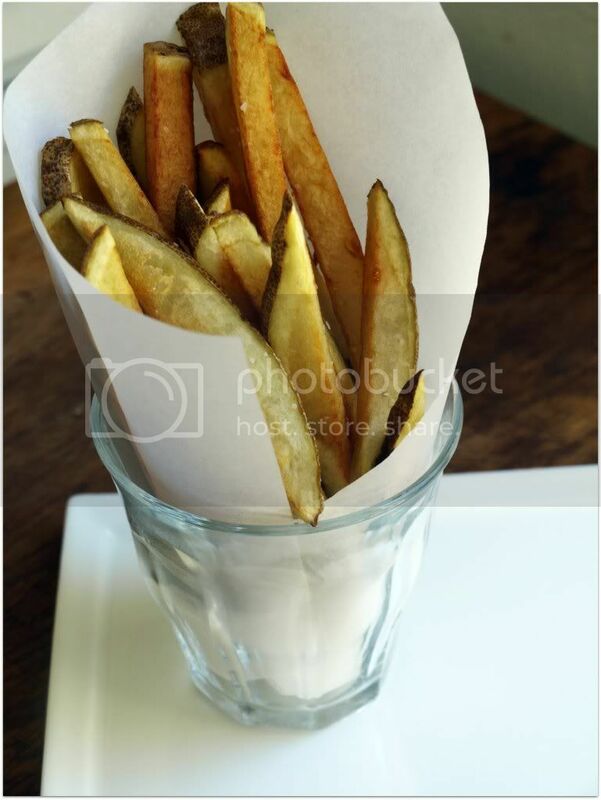 As a family we didn't eat out a lot and that's pretty much the only time anybody ever eats fries so I knew homemade french fries were a special treat and boy was I ever going to make it special by eating as much as I could possibly stuff in my mouth! Funny the things you remember, I don't remember my mom giving me much advice about boys or help with all the high school drama but I always hear my mom saying that the key to making good fries is to fry them twice. You know what, she's right. Class dismissed and remember to be safe out there! I've never made home made fries, and my mother certainly never made them growing up - anything fried was considered the enemy. So, I guess I'm odd man/woman out. But I do have all the items needed for this experiment. So, I'm ready. And willing. OHMYGOSH. You're making homemade fries with Crisco? Can I sit in the front row? Do you even know how I feel about french fries? I view them as mental health food. That I need regularly. Or I get mean. I can't wait to see this. I have indeed made fires in my frying past. My mother made them when I was little but she used to add masala spice becasue she couldn't imagine why you would eat them plain. the first fry is actually called a blanche! I'm a crappy student so I won't do it on time but I'll definitely need to try. let's call it auditing the class because that makes me sound less like a slacker. Sorry I was late teacher. I promise I'll be on time next class. Here's a "pomme" as a gift. I don't remember ever making french fries, though surely I did at least once back in my deep fryer days. I sure would like to eat those french fries though. I definitely have a weakness for even mediocre french fries! I have a deep fear of frying. I just know I'll burn myself or somehow start a fire! The only fries that have been made in my house in the past six months are frozen Ore-Ida's baked in the oven. BUT, I LOVE homemade french fries! I'll be back tomorrow. But teach...what can we do with all the extra oil? That's always my concern. Can you really keep it? Any advice for baking your french fries?? Or is that a total no-no?